I have read most of the reviews and my belief is that there are two different versions of this ball. There is the original Revolution Solid that comes in the blue and black box and the revamped version in the red box. I absolutely love the "original" revolution solid (blue and black box). I find the ball to be reasonably long and have great touch around the greens. Definitely not as much bite as the Pro V1, but enough to hold the green. I gave the original a 5 our of 5. The newer (red box) revolution solid would get a 1 out of 5. It is hard as a rock with no touch around the green. They must have changed the cover material as it is not what it used to be. I bought a box thinking it was the same only to find out otherwise. This ball has been blasted by several on the site and I must admit I must be playing a different ball. Today 546 yard par 5. diver , 7 iron 2 putt bird. 178 yard 7 iron and took a 1 foot bounce and stopped dead. Same result on my way to a 74. Never off line , putts great and 24 for $9.00. As long as i can find em I'll keep playing them. My swing spped is 110 and the ball works for me. Switched between Pro Vx and Rev on my round yesterday, While I did spin the Pro V more, it wasnt enough of a difference to justify me spending the extra $40 a dozen. I personally like the feel of the ball, but I also putt with a Taylor Made Nubbins, so putter feel isn't as big an issue for me. I played in high school and was all about the short game. My Becu lob did rip the cover on the one shot I took with it, but that happens with every ball that gets to meet that club. Pro Vx, Laddies, Z-Urs, Precept feel/Ad333, etc. The Rev Solids have a soft feel of any club face with minimal spin of the tees making for straighter drives, but can also check around the green. I bought a double dozen a few weeks ago, found them to be excellent golf balls and decided to buy 20 dozen to stock up. I advise this golf ball for any kind of player. If you want a high spin ball that backs up on the approach shot to the green then spend $40 a dozen (possible exception NIKE Power Distance Soft at $17). 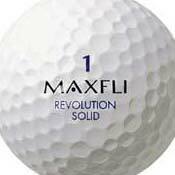 The next best thing is a ball that stops and the Maxfli Revolution Solid LTD is in that class. As for distance, these balls are probably a little higher compression than most average golfers need which is why they might fell like rocks to some golfers. If you're normally a 250 yard drive or longer hitter, these balls will go as far as any other ball and actually seem to be little straighter than most in windy conditions. Most golfers over a 10 handicap lose a ball before they wear them out, so the softer cover (easier to scuff) isn't that big a factor. If you play a lot of golf, have a 10 to 20 handicap, a fairly hard hitter, and you are not rich or have a cousin who gets free Pro V's that he gives to you, then this is an excellent value for an every day ball at about $10 a dozen. Yeah they're hard and not as soft as you wished, but hey, you can get 24 balls now for about $20. They're a lot better and cheaper that buying scuffed up balls out of lost ball bin at your local golf course shop. topflite, titleist, hogan, nike, any lost ball found on the golf course. Hard, heavy, low-tech ball. Low ball flight limits distance. They do go a long way if you "flush" a drive, otherwise "forget about it". Scuffing is not a problem as I hit several off cart paths with no discernable wear and tear. Would recommend the Top Flite XL for beginners. At least you know then that you are getting a hard distance ball. This one says "soft" but it isn't. Spin is also minimal so it tends to go straight and bounce a lot on greens.